Santa Clara Valley Transportation Authority (VTA) awarded Mott McDonald/PGH Wong Engineering Joint Venture (MMW) a USD 125 million contract to provide general engineering services for BART Silicon Valley Phase II Extension. Under the contract, MMW will perform design and engineering work on the 8-km tunnel, four station areas, two ventilation structures, and system-wide work – advancing the design in preparation for the federal funding request in spring 2020. VTA’s Phase II project is a 9.6-km extension of Bay Area Rapid Transit into downtown San Jose and Santa Clara, California, utilizing an innovative single-bore tunneling methodology that minimizes construction disruptions. The project will include four stations, with three underground and one above, an 8-km metro tunnel, two ventilation structures, and a maintenance facility. The total value of the project is estimated at USD 4.8 billion. Bay Area Rapid Transit will be responsible to operate and maintain the extension after its completion. The estimated weekday ridership on BART Phase II Extension is 33,000 passengers. BART regional heavy rail system will be expanded by a 25.7-km extension, of which a 16-km extension part of the first phase is under construction and the 9.6-km extension in the second phase. The system will be expanded to Milpitas, San Jose and Santa Clara. 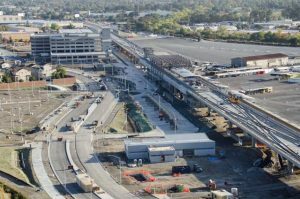 When completed, this fully grade-separated project will include six stations total, an 8-km tunnel in downtown San Jose and a new maintenance and storage facility in Santa Clara.